Uganda’s oldest male Chimpanzee Zakayo aged 54 years has died. Zakayo lived at the Uganda Wildlife Education Centre (UWEC) the former Zoo in Entebbe for the last 42 years. One of the Tourists attractions in Uganda Wildlife Education Center are the Chimpanzees. According to the marketing officer, Isaac Mujaasi, preliminary findings suggest that Zakayo succumbed to Chronic Gastroenteritis- a condition of persistent vomiting and diarrhea caused by either viral or bacterial infection. “Due to his old age, he was highly susceptible to opportunistic infections. Please join us as we celebrate the life of this legendary chimpanzee who once lived as a dominant male and brought up the chimpanzee family at UWEC,” said Mujasi. Zakayo’s name has been synonymous to Chimpanzees both in the wild and those under captivity. People in their 40s or 50 years of age, tell stories of how Zakayo would be offered cigarettes and alcohol in return for his acrobatic antics. His death came a few months after the primate had just celebrated 54years in October last year, at a ceremony that was attended by over 1000 school-going children and graced by the state minister for primary education Hon. Rosemary Seninde. On 10/06/1964, Zakayo was rescued from Semliki National park in Bundibugyo (South Western Uganda) and was estimated to be one year of age. Thirteen years later(1976), he was surrendered to Entebbe zoo where he lived till his demise. Zakayo was the Alpha male(leader) from 1970s to 2011, when he handed over power to Matooke who was later toppled by Aluma. Although he has no-longer been the Alpha male- a super active individual, he has seen the rise of Matooke, Aluma and Onapa challenge each other for the alpha male position at UWEC. James Musinguzi, the managing director at UWEC said, in all situations, Zakayo has been coming out as a peace lover and maker whom other aggrieved chimpanzees used to run to, for consolation and help. He added that Zakayo has been making the integration of new or infant chimpsanzees into the group, look very simple. “He never disrupted nor interfered with the transfer of leadership neither could he involve self in aggressive displays or fights,” said Musinguzi. 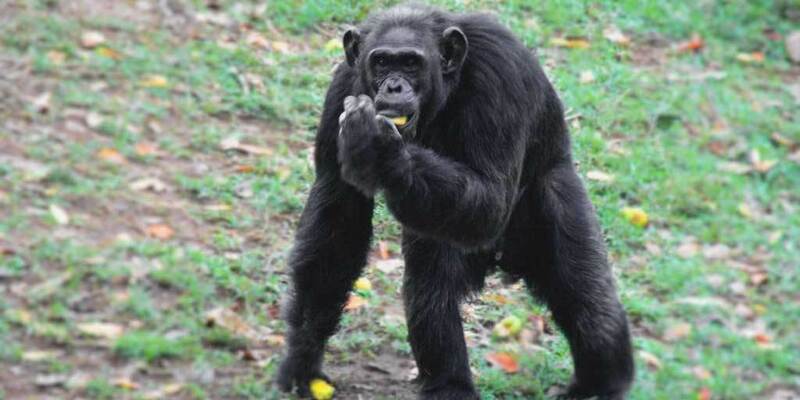 Zakayo died a highly respected member of the 18 UWEC Zoo chimpanzees.